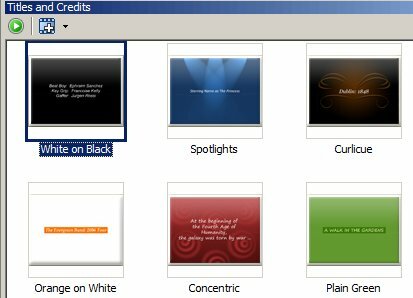 The Title and Credits Collection displays all the templates that you can use to add text to your movie. You can open the Collection in several way: click on the View menu and then Titles and Credits, use the Ctrl + 4 keys, or click on the Titles and Credits button on the toolbar. Title at the Start: This adds the selected title effect as a new clip at the very beginning of the Storyboard, before any existing clips. Title on Selected Clip: This is identical to clicking the Add to Clip button itself. Text is visible "on top" of the selected clip. Title before Selected Clip: The selected Template is added as a new clip on the Storyboard, placed just before the selected clip. Credit at the End: The Template is added as a new clip, which is the last clip in the Storyboard, after all the existing clips. Right-clicking on a Template opens an Options menu, which has two selections: Add to clip and Preview. These work exactly like the two buttons in the toolbar. For more about how to use the text templates, see Titles and Credits.